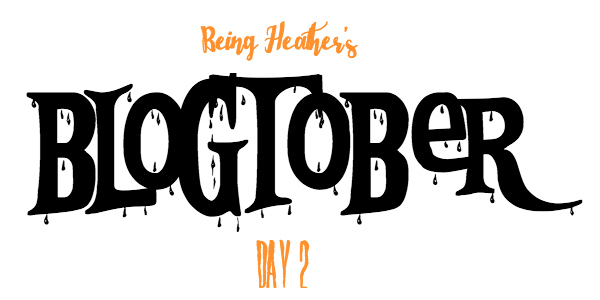 Hi y'all, and welcome to BLOGTOBER DAY 2! 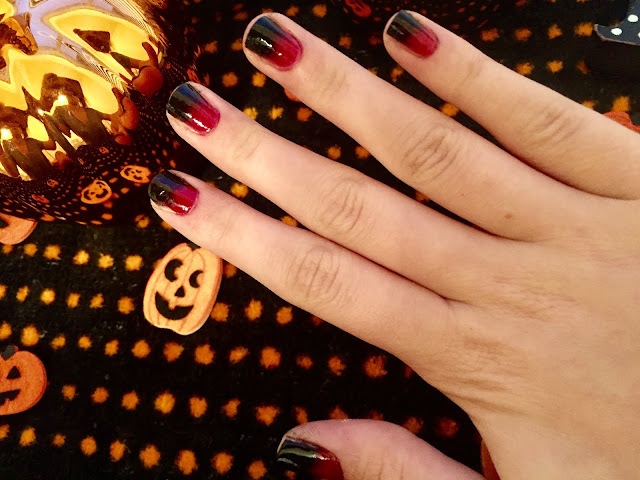 I love adding a bit of Halloween spirit to everything I can this time of year, and my nails are no exception. 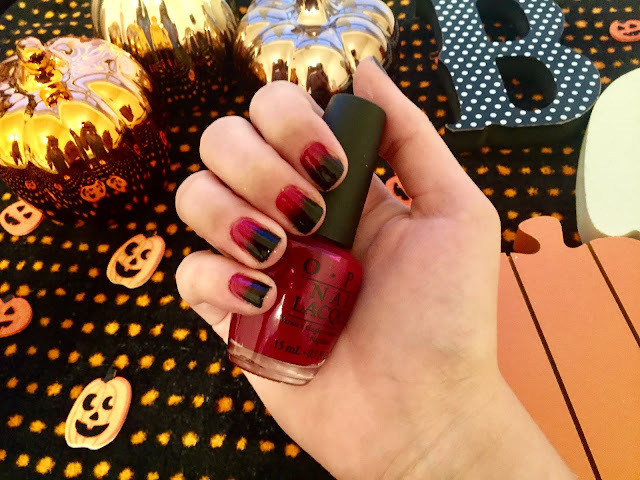 It's so fun to play around with different nail polish colors and create Halloween themed looks. 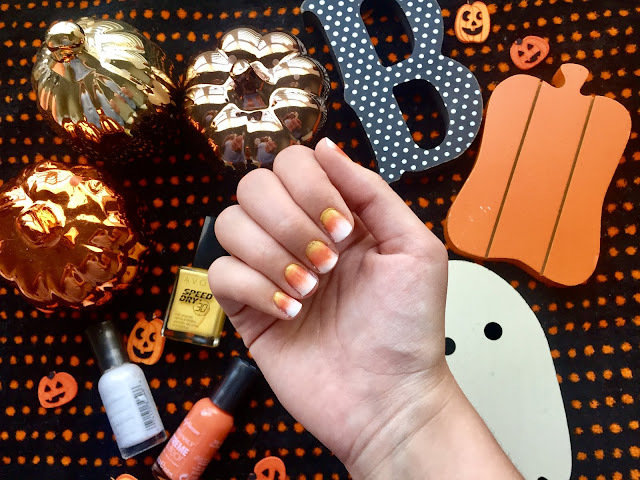 Since I've always loved painting my nails, and am a nail polish hoarder, I thought it would be perfect to create three (easy) Halloween nail looks to share with all of you so that you can keep your manis looking festive! I am by no means anywhere near an expert at nails, so I wanted these three looks to be something simple that everyone can do! I hope you enjoy! I love this nail look! It's so easy to do and since it's ombre, you don't have the worry about getting straight lines since the colors are supposed to blend together a bit. Plus, I just think it's so cute! I mean, who doesn't like candy corn? 1. 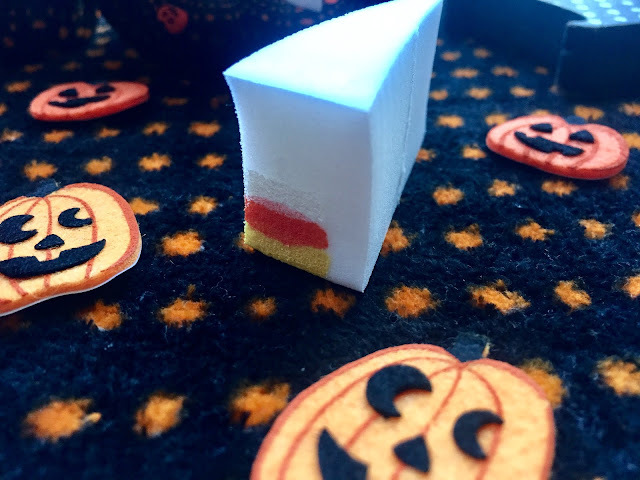 Take a cosmetic sponge, and brush a stripe of each nail color onto the flat side of a cosmetic sponge in the order of the candy corn colors (see picture below). 2. Press the sponge onto your nail, dabbing until the color transfers. Repeat, adding more nail polish stripes to the sponge, and continuing to press onto your nail until you achieve your desired look and opaqueness. 3. Allow to dry for a couple minutes, then put a clear top coat of polish on top to blend colors together. 4. Use nail polish remover and a Q-tip to clean up excess polish around finger, and you're done! 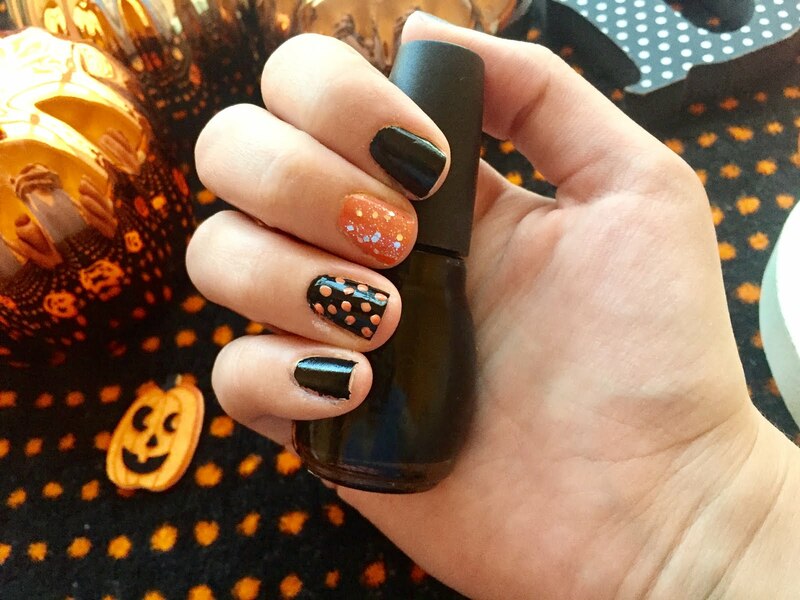 This one is super easy, and basically just plays on the traditional orange and black colors of Halloween with a couple of cute accent nails! Steps: 1. Paint 4/5 nails black. 2. Paint remaining nail orange. 3. Top orange nail polish with silver sparkle nail polish. 4. 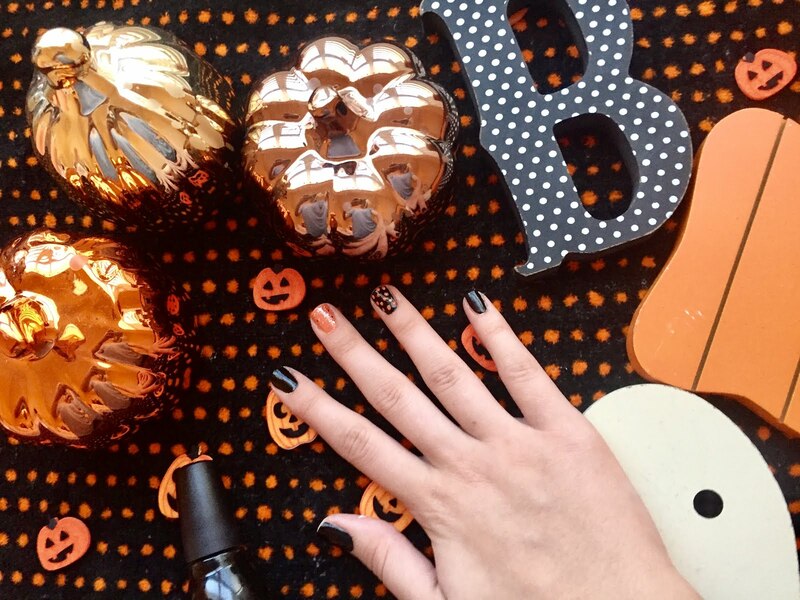 Take a dotting tool and the orange nail polish and put orange dots on one black nail. I liked this one because it gave off a different, darker, vampireish Halloween vibe than the other two looks did. It's also easy to do! Steps: 1. Take a cosmetic sponge, and brush a stripe of red and black nail color onto the flat side of a cosmetic sponge. 2. Press the sponge onto your nail, dabbing until the color transfers. Repeat, adding more nail polish stripes to the sponge, and continuing to press onto your nail until you achieve your desired look and opaqueness. And that's it for my 3 easy Halloween nail polish looks! 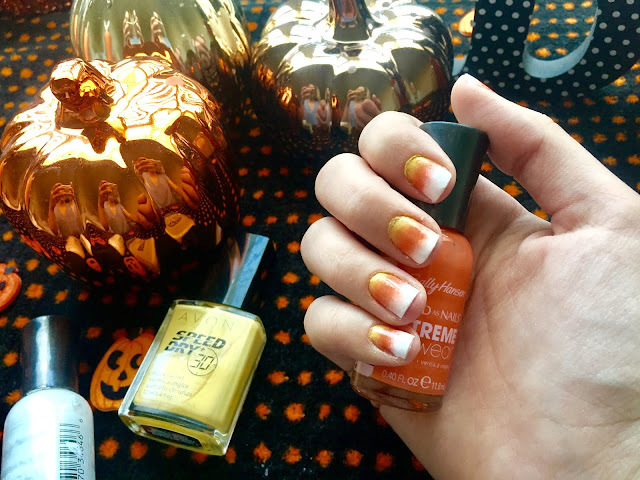 I hope you all enjoyed this post and are inspired to try out one of these looks, or create a Halloween nail look of your own! 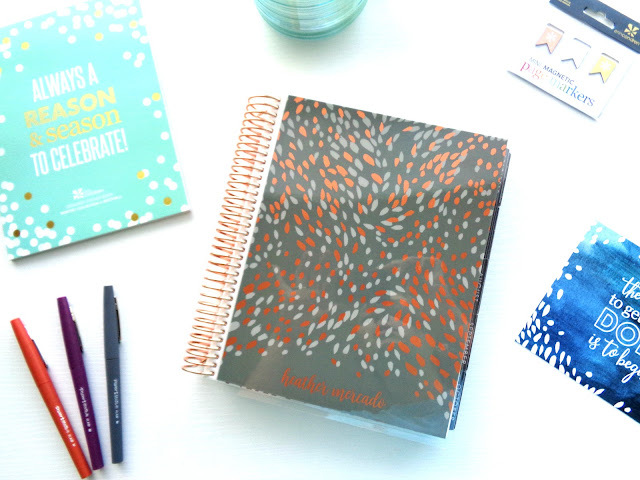 Stay tuned for Blogtober Day 3 coming soon! So super cute! 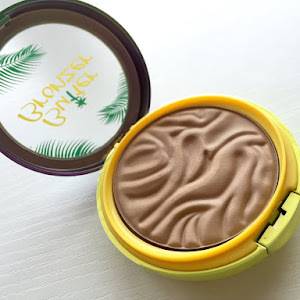 I cannot wait to try this!!! These are all so cute! 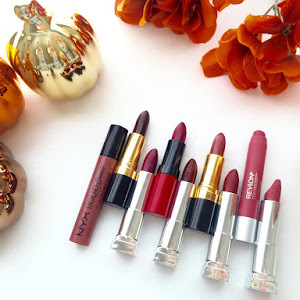 I'm leaning toward trying the ombre candy corn and vampy, though! 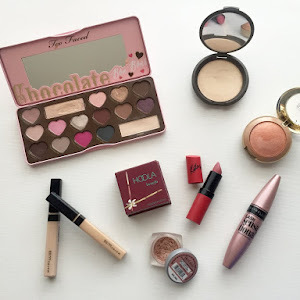 Love these looks! 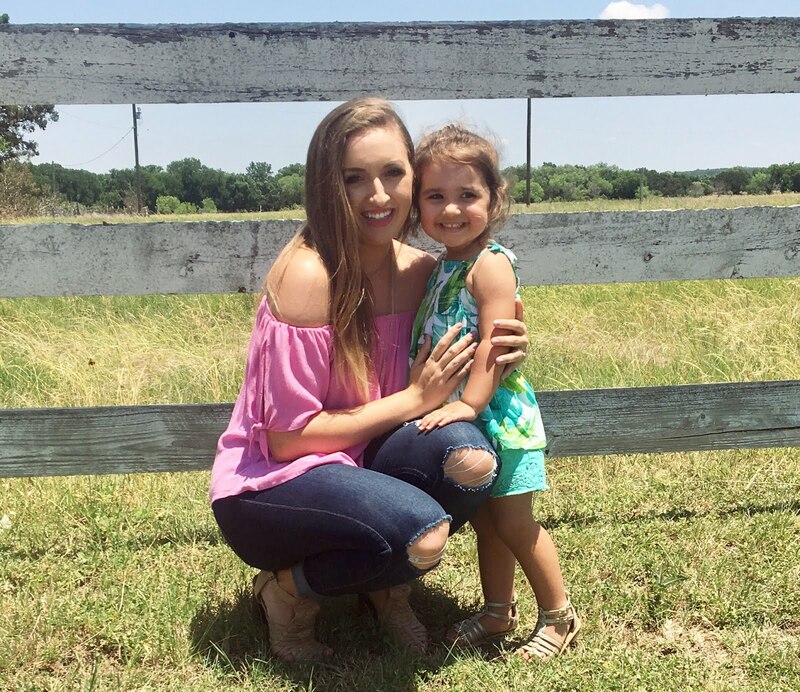 Super cute designs! 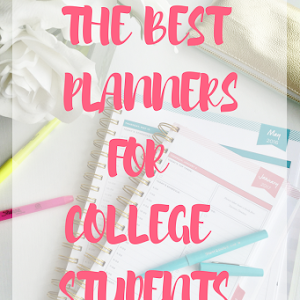 I am going to pass this on to my daughter she is going to be jazzed. I love the candy corn nail polish.